I decided to cast the forward hull of the Sdh. 234 that I was working on since I would be using it for modifying a number of different models. I poured a one piece mold, and mixed up some resin to cast the part. It was my first time casting resin, so imagine my surprise when I came back after pouring and saw that the mold looked like a pot that had boiled over! I pulled out the part, and saw that it was filled with bubbles, but I decided to use it anyway. 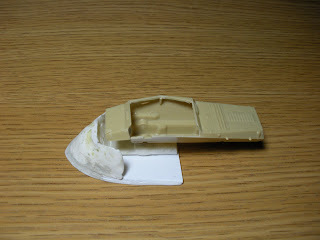 The hull will need some more putty work, but I don't think that it is too horrible for a first attempt despite the interior being rather like swiss cheese. In any event, I realized that my original plan to add a second piece to the mold for casting a plenum chamber into the hull would be more problematic than I had first anticipated, so this piece will become a new master hull for subsequent models. 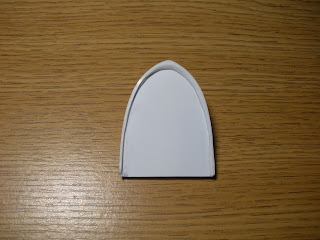 Using the hull pattern, I cut two pieces of thick plastic card, and one thin piece of plastic card into the proper shape. 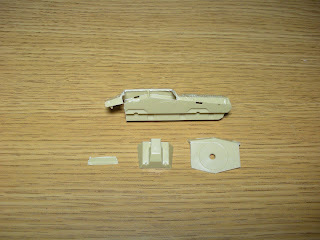 I cut away the middle of the first piece, and glued it to the bottom of the second piece. 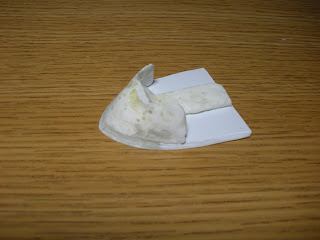 I then cut away the middle of the second piece, and glued it to the bottom of the thin piece. A Matchbox SdKfz. 234 will undergo the transformation into the Sdh. 234, but first it had to go through a little reconstructive surgery. I'll probably still have to lengthen the upper hull to make it the right size.